The District of Muskoka is pleased to announce funding from the Province of Ontario and the Government of Canada to establish a new Integrated Child Care and EarlyON Child and Family Hub at 180 Brock Street Gravenhurst. The new Hub will include dedicated EarlyON space, re-location of the Nest Family Resource Centre and 15 new licensed child care spaces for children ages 0-12. The new integrated Hub comes in response to a call for submissions put out by the Ministry of Education in November of 2017 for Community-Based Early Years and Child Care Capital Program funding. As part of the provincial government’s support for the early years and child care system, and better meeting the needs of local communities, as well as the commitments made under the Canada-Ontario Early Learning and Child Care Agreement (ELCC), the funding opportunity was provided to support greater access to licensed child care and child and family program locations (also known as EarlyON Child and Family Centres). “This new integrated hub is great news for parents in Gravenhurst and the surrounding communities. The new facility will help make life easier for families by increasing choice when it comes to child care and increased child and family space,” said Lisa Thompson, Minister of Education. 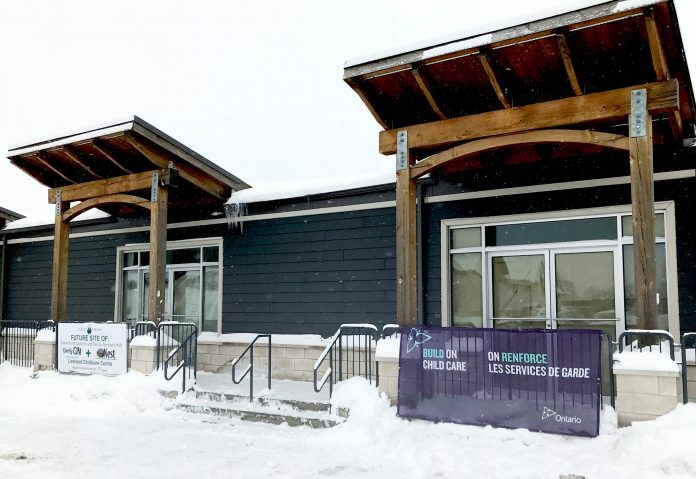 The District of Muskoka is currently in the process of selecting a licensed child care centre operator for the Hub and programming is expected to begin following the Grand Opening late spring 2019.